Cyclone tube gas-liquid separator:When the gas flows containing liquid into the gas-liquid separator, due to the rotation of the cyclone vortex tube design, the flow will produce a strong vor tex motion, creating a strong centrifugal force, making the solid particles and liquid impurities attached to the cyclone tube wall. After the impurities are separated from the gas stream, then fluid accumulates in the region of the container. Gas af ter purification leaves cyclone tube separator with minimal pressure drop into the next level of filtering. 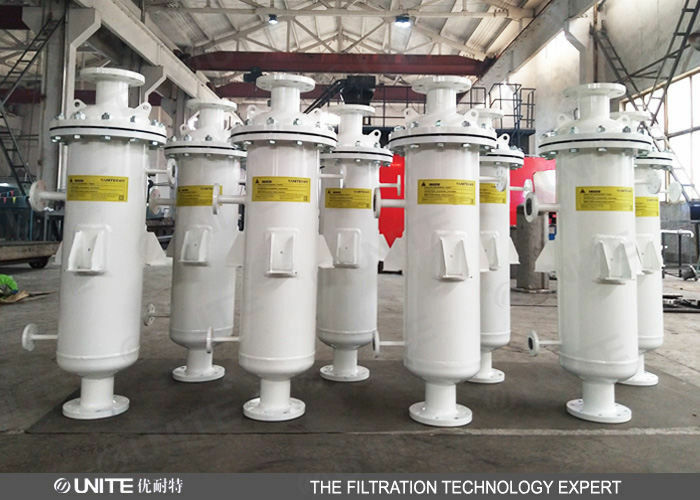 Cartridge filtration and separation:this level is made of numbers of filter elements which can be replaced or repeatedly cleaned. Such type of filter element and the accuracy level are selected according to work conditions, the purpose is to remove the smallest solid particles and condense mist and make maximum droplets could be removed from the separator. We also can provide more and better customized products with different demands to our customer. China Good Quality Automatic Self Cleaning Filter Supplier. Copyright © 2015 - 2019 automaticselfcleaningfilters.com. All Rights Reserved.